Mike Tyson's Punch Out -- NES/Nintendo. Condition is Good. Shipped with USPS First Class Package. Mike Tyson's Punch-Out for NES. Nintendo NES. Nintendo 64. Nintendo DS. Super Nintendo. This item is genuine, original. If you are not happy with it we will work to fix the problem. Just let us know. New ListingMike Tyson's Punch-Out (Nintendo NES, 1987) Tested & Working. Mike Tyson's Punch-Out (Nintendo Entertainment System, 1987) TESTED. Condition is good. Shipped with USPS First Class Package. Trending at $24.11eBay determines this price through a machine learned model of the product's sale prices within the last 90 days. Double Dragon III 3 & Mike Tyson's Punch-Out!! - CLASSIC NES Nintendo Games LOT! Mike Tyson's Punch-Out (Nintendo Entertainment System, 1987). Condition is Good. Shipped with USPS First Class Package. The original box and instruction manual are not included. Mike Tyson's Punch-Out (Nintendo Entertainment System, 1987). Condition is Very Good. Shipped with USPS First Class Package. Label is in very good shape, cartridge has some areas that show discoloration, clean. Pin connectors have been polished, tested, excellent working order. Feel free to contact me if you have any questions, thanks. Stock photo. Includes game cartridge only. Game is in overall good shape, showing typical wear. Games are thoroughly cleaned, tested, and fully functional. Mike Tyson's Punch-Out (Nintendo Entertainment System, 1987) **TESTED & WORKING. Condition is Good. Shipped with USPS First Class Package. Mike Tyson's Punch-Out (Nintendo Entertainment System, 1987)-Tested. Condition is Acceptable. Cart Only. Shipped with USPS First Class Package. All pictures are generic and for reference only. 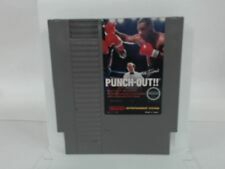 Mike Tyson Punch Out Nintendo Nes GENUINE!! Mike Tyson's Punch-Out holograms with tips on back. Not a game See pictures. Mike Tyson's Punch-Out (Nintendo Entertainment System, 1987). Condition is Very Good. Shipped with USPS First Class Package. MIKE TYSON'S PUNCH-OUT NES Nintendo Good. Condition is Very Good. Shipped with USPS First Class Package. Mike Tyson's Punch-Out! Nintendo NES. Mike Tyson's Punch-Out! See pictures. Won't last long ! BUY IT NOW before it's gone ! Mike Tyson's Punch-Out Manual (Nintendo Entertainment System 1987). Condition is Good. Small initials on front. See pics for details. Shipped with USPS First Class Package. Title : Mike Tyson's Punch-Out! The box and manual are NOT included . Condition : Good to very good used condition. It is excellent shape. NES Nintendo Mike Tyson Punchout nintendo 1984 working. Condition is Acceptable. Shipped with USPS First Class Package. 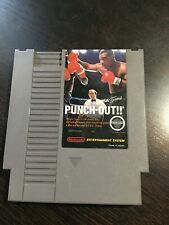 Mike Tyson's Punch-Out (Nintendo NES, 1987) Tested & Working. Punch Out! Mike Tyson's for NES. Item is original. Used in excellent condition, working. The sticker is also in great shape, complete and not ripped or peeled off. I do not have a Nintendo any more to test this, so it is being sold as is. It did belong to my original collection and did work. Mike Tyson's Punch-Out (Nintendo Entertainment System, 1987) cleaned and tested! Mike Tyson's Punch-Out (Nintendo Entertainment System, 1987) cleaned and tested!. Condition is Very good! Game has had connections polished so you wont have to worry about dirtying up your console with some junk others might sell you. Any questions please ask thanks! 5 out of 5 stars - Mike Tyson's Punch-Out (Nintendo Entertainment System, 1987) cleaned and tested! 305 product ratings305 product ratings - Mike Tyson's Punch-Out (Nintendo Entertainment System, 1987) cleaned and tested! Mike Tyson's Punch-Out (Nintendo Entertainment System, 1987) NES Please Read!!! 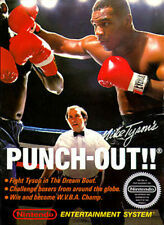 5 out of 5 stars - Mike Tyson's Punch-Out (Nintendo Entertainment System, 1987) NES Please Read!!! 305 product ratings305 product ratings - Mike Tyson's Punch-Out (Nintendo Entertainment System, 1987) NES Please Read!!! MIKE TYSON'S PUNCH-OUT!! -- NES Nintendo Cleaned, Very Good With Sleeve! Minor signs of use and play only. Includes dust sleeve. 5 out of 5 stars - MIKE TYSON'S PUNCH-OUT!! -- NES Nintendo Cleaned, Very Good With Sleeve! 305 product ratings305 product ratings - MIKE TYSON'S PUNCH-OUT!! -- NES Nintendo Cleaned, Very Good With Sleeve! Mike Tyson's Punch-Out (Nintendo Entertainment System, 1987) complete. Condition is Very Good. Shipped with USPS First Class Package. **JAPANESE IMPORT** will require converter to fit/function on an American NES. Item has been tested on Nintendo Famicom console. Authentic Nintendo Famicom cartridge only. Game in photos is actual item for sale. Shipping available within USA only. Punch-Out for Original Nintendo NES, the Prequel or Altenate ending to Mike Tyson's Punch-out with Lil' Mac and his trainer?. Exact Item as Pictured. Slight scratch to bottom left side as shown. Otherwise minty. Mike Tyson's Punchout. Our sales manager will leave you positive feed back once you have left positive feed back for us. (If available). Unless otherwise noted. The 72 Pin Connector inside of your original Nintendo console is the key to the longevity of your system. IMPORTANT INFORMATION ABOUT YOUR NINTENDO SYSTEM!